Our last action was to fill in the beginning of Satan’s story, in Eden, which also served to highlight that now we have both the beginning AND also the end of Satan’s story, in the lake of fire. So, as that is the case, one thing we might be looking for to reveal more information, is another passage that talks about someone being in Eden, or being destroyed by fire. Our last thread that was left hanging, closest to a match we had, was on the “sons of God” in Job. So let’s just do a word search on these terms to see if we can find anything. ”Lake of fire” nope “thrown into fire” nope “sons of God” hmmm well seems some “sons of God” took wives in Genesis 6… that might be interesting to pursue, but Satan doesn’t seem to be mentioned here. We covered this story in great detail in part 2, and more in part 3 in this series, but now we are focusing on proving out Satan’s story, so let’s not pursue this for now. 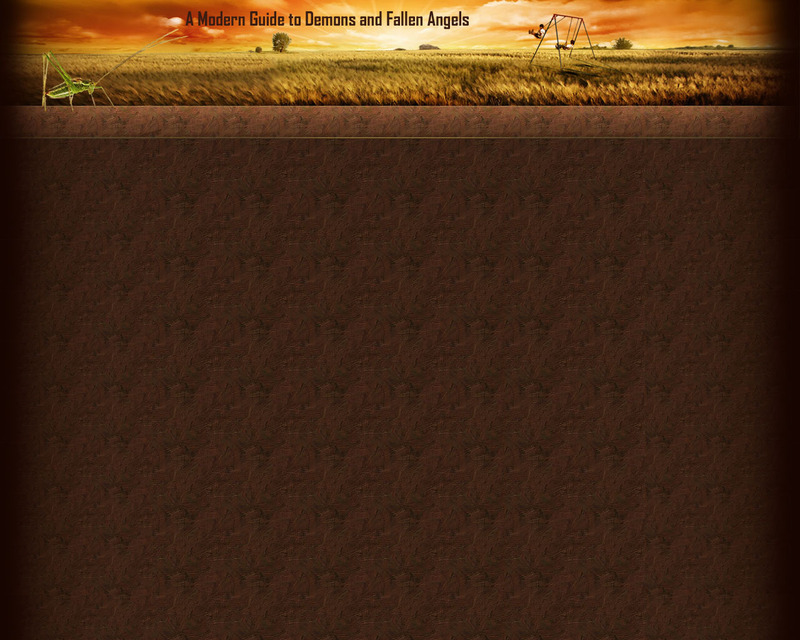 Okay… “garden of Eden” hmm let’s see Joel 2… Ezekiel 28… and Ezekiel 31. Ezekiel 31 we have the Assyrian… buried in the pit when God restrained the flood water… nope that’s not it… Satan seems to still be active and free to roam, not buried in the Earth…. 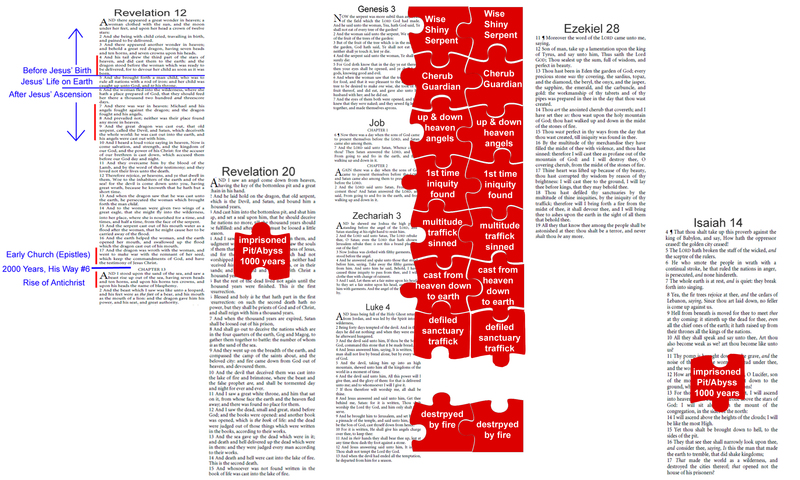 Joel 2 seems to be about God’s horse army… hmmm… no mention of Satan… Okay…. Ezekiel 28… aha! 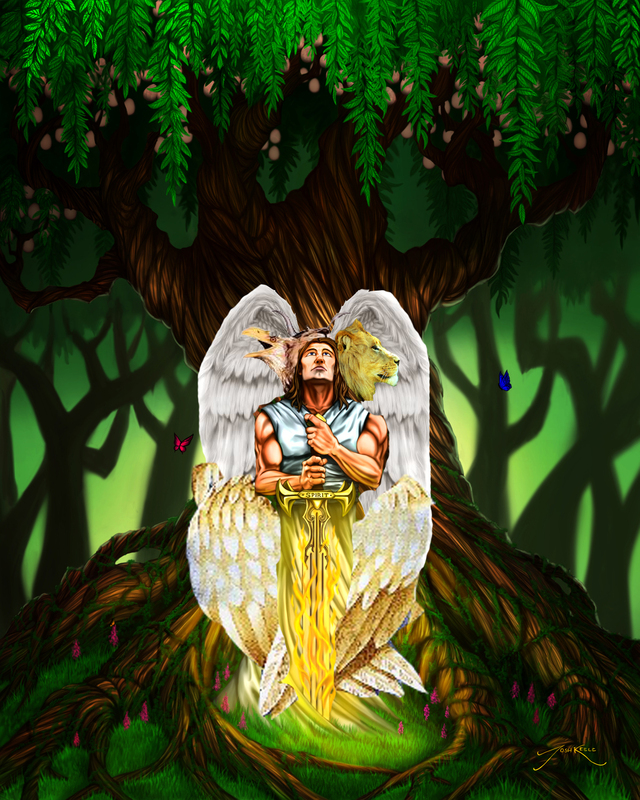 Starts out in Eden, he sins, is cast to the ground, and it end by him being consumed by fire. The beginning in Eden, and the ending with fire, matches the story of Satan, as does being cast to the ground; sin and many iniquities are also mentioned. This would make sense to be about Satan. However, this is specified to be about the “king of Tyrus”. As we covered in part 3, in points 8 and 10, prophecies can have both literal or spiritual fulfillments, and can be cyclic. As such it’s perfectly allowable, according to those points, for this to both be about a human man who was the King of Tyrus, and to be about Satan also, in a different literal vs. spiritual fulfillment. His Way #6 also factors in here, as this covers 7000 years, so silent gaps of time must be able to be found in this passage. But as we are setting out to prove this out, let’s just refer to John 12:31, 14:30, 16:11 which all refer to Satan as the “prince of this world”, and Luke 4, where Satan claims authority over all the kingdoms of the world, in tempting Jesus Christ. So Jesus confirmed Satan to be the prince of this world at that time, so for now let’s look at it this way in Ezekiel 28: that Satan is the spiritual king of Tyrus, and there also being a human man who is king of Tyrus, and there being a parallel to be found in their stories. Both can be true. So let’s start by comparing what is obvious in Ezekiel 28, to the chronological timeline we already have about Satan, and see how it lines up. There are 3 obvious parallel points, of Satan in Eden, Satan cast to the ground, and Satan devoured by fire. Lining these up with known dates, it would seem that Ezekeil 28:14-16 would need to line up to events contained in Rev 12:1-5, Ezekiel 28:17-19 would line up to events from Rev 12:7-17, up to events of Rev 20. So now that we have a general timeframe in which to look, let’s see if anything else about Satan in Ezekiel 28 lines up. Eze 28:12… Thou sealest up the sum, full of wisdom, and perfect in beauty. 13 Thou hast been in Eden the garden of God; every precious stone was thy covering, the sardius, topaz, and the diamond, the beryl, the onyx, and the jasper, the sapphire, the emerald, and the carbuncle, and gold: the workmanship of thy tabrets and of thy pipes was prepared in thee in the day that thou wast created. How in the world does this match? Well, in Gen 3 the serpent is “crafty” (6175), and if we look up that word it means prudent, sensible, or shrewd, and “wisdom” (2451) in Exe 28 also means prudent or shrewd… so these words are synonyms. Gen 3 matches Exe 28 on this point about Satan or the serpent. That’s easy. Next, Ezekiel has a description of Satan covered with gemstones, set in hollows or sockets. Something covered with gemstones is going to be rather sparkly or shiny, as gemstones sparkle, shine, and reflect light. We haven’t gotten to the divine council yet, but to understand this next connection, we are going to watch a few clips from the Ancient of Days lecture by Dr. Michael S. Heiser on the topic of the possible meanings of the Hebrew word “nachash”, as this is the word for “serpent” in Gen 3. The lecture is called “Annunaki, Serpentine Beings, and the Netherworld in Ancient Texts”, watch Minutes 6-8, Minutes 23-25. 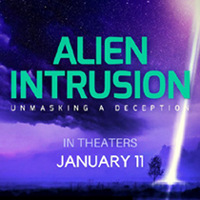 You can watch the full lecture on this over at the Alien Resistance Youtube Channel, along with many other fascinating lectures by Dr. Heiser. And so nachash as a noun means serpent, but as an adjective it means Shining. As such there is a double meaning of the word “nachash” in Gen 3, both of a serpent and of one who was shiny. In Ezekiel 28, the gemstones are shiny. This is also a match, shiny gemstones in Eze 28, with the shiny nachash in Gen 3. Like matching one piece of a puzzle to another, shiny matches shiny, and so we have our answer. The shiny gemstones in Exe 28 refer back to the word “nachash” in Gen 3, and the “serpent of old” as Rev 12 puts it, refers back to the serpent, the “nachash”, in Gen 3. My personal take on how this worked, what would make sense to me, is that much like Satan entered into Judas to accomplish betraying Jesus, that Satan worked through a snake-like animal in a supernatural way, to speak to and try to deceive Eve. I think this because the Greek for serpent in Rev 12, ophis (3789) really does seem to just refer to a snake. Also, later in Genesis 3 we can see that God seems to curse snakes, making them to go on their bellies and eat dust, which would indicate that much like Judas’ actions when Satan entered into him, the snake was held to account for its actions while under Satan’s influence. And so it seems that the story of the serpent in Gen 3 matches up with Eze 28:12-13. What we basically have here is a simple riddle. What was shiny, had wisdom, and was in Eden? That’s right, the nachash. 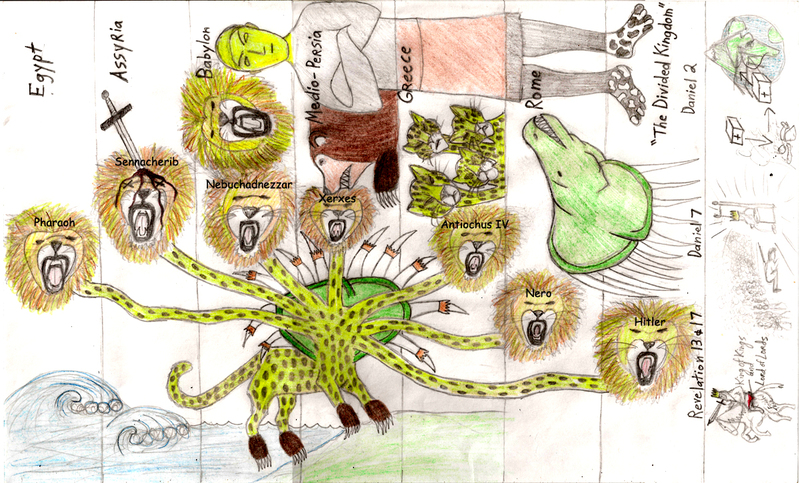 It’s a riddles composed of visuals, pointing to the serpent in Eden, which Rev 12 indicates is Satan. So now we have some confirmation that Eze 28 is in fact about Satan, along with the parallel we already had of being in Eden, being cast down to earth, and being devoured by fire. thou wast upon the holy mountain of God; thou hast walked up and down in the midst of the stones of fire. What could this be? In the last example, it was easy because everything pointed to Genesis. But since we have an established chronology to work from, we can figure that whatever this is referring to is to likely be found in the Old Testament, or at least prior to Jesus Christ’s ascension. We have several passages naming Satan by name, which might fit in somewhere, which were still left hanging. The scene here is of Satan walking up and down, in the midst of stones of fire. Does the visual here match any of these scenes? Eze 28:14 …thou wast upon the holy mountain of God; thou hast walked up and down in the midst of the stones of fire. Job 1:6-7 Now there was a day when the sons of God came to present themselves before the Lord, and Satan came also among them. And the Lord said unto Satan, Whence comest thou? Then Satan answered the Lord, and said, From going to and fro in the earth, and from walking up and down in it. Job 2:1-2 Again there was a day when the sons of God came to present themselves before the Lord, and Satan came also among them to present himself before the Lord. And the Lord said unto Satan, From whence comest thou? And Satan answered the Lord, and said, From going to and fro in the earth, and from walking up and down in it. Something matches here in the terminology – Satan walking up and down. That’s a match. But what about the rest? Ezekiel says “in the midst of the stones of fire” and the closest thing that matches in Job is Satan being “among” the sons of God. So how could this match? What are stones of fire? Angels are said to be flames of fire. This would match. How about the stones? The word here in Eze 28 for stone, “eben” (68) can refer to precious stones or gems. The appearance of Gabriel, at least at first, was that he had a body like beryl, a type of precious stone or gemstone, in particular what we might likely call today a yellow topaz. So there does seem to be precedent here that sometimes the sons of God type of angel could appear to have a body similar to a precious stone or gem in some way. And so stones of fire could easily refer to angels, as flames of fire, looking in a way like a gemstone. It seems that again, we have visual or symbolic clues that match eachother. This would most easily make sense, as it sounds, that they came to the Lord to present themselves, and in doing so were going somewhere else then where they had been. When asked where he came from, Satan said he had come from walking up and down, to and fro on the Earth. This would seem to indicate that when the sons of God, and Satan with them, came to present themselves to the Lord, that they had left the Earth and come to the Lord, in another location. As such this does not seem to be describing a mountain on Earth. 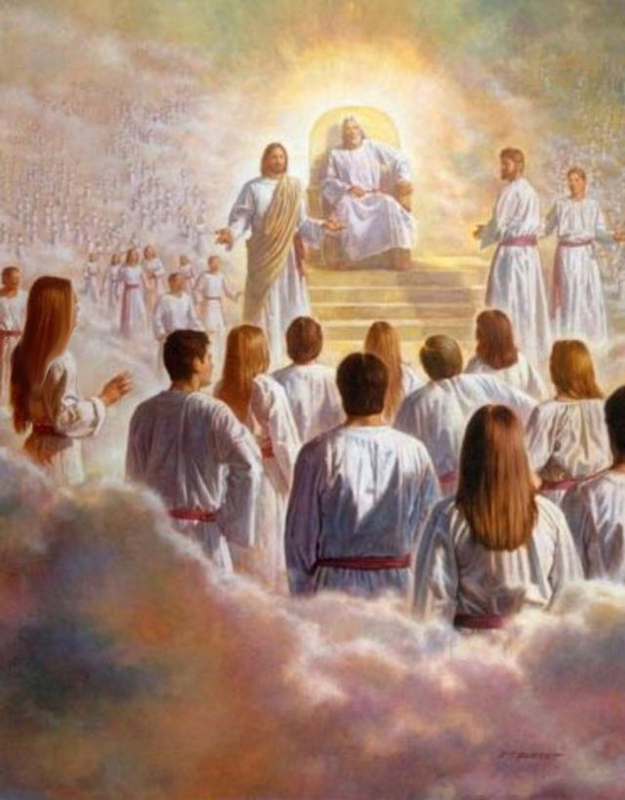 Most simply, it would seem that they have come to God’s throne in the 3rd Heaven, and are presenting themselves before Him there, at His throne. If so, then the “mountain of God” in Eze 28 would be the third Heaven, where God’s throne is. Looking a little further, Eze 28 says that God casts Satan as profane out of the mountain of God, and then down to the ground. This makes an excellent contrast that the mountain of God is above the earth, and would parallel well with Satan being cast out of Heaven and down to the Earth in Revelation 12, and banned from Heaven and God’s presence. ( Rev 12:7-13 And there was war in heaven: Michael and his angels fought against the dragon; and the dragon fought and his angels, And prevailed not; neither was their place found any more in heaven. And the great dragon was cast out, that old serpent, called the Devil, and Satan, which deceiveth the whole world: he was cast out into the earth, and his angels were cast out with him. And I heard a loud voice saying in heaven, Now is come salvation, and strength, and the kingdom of our God, and the power of his Christ: for the accuser of our brethren is cast down, which accused them before our God day and night. And they overcame him by the blood of the Lamb, and by the word of their testimony; and they loved not their lives unto the death. Therefore rejoice, [ye] heavens, and ye that dwell in them. Woe to the inhabiters of the earth and of the sea! for the devil is come down unto you, having great wrath, because he knoweth that he hath but a short time. And when the dragon saw that he was cast unto the earth, he persecuted the woman which brought forth the man [child]. So this seems to also be a match in Eze 28:14 and Job 1 & 2, that “thou wast upon the holy mountain of God; thou hast walked up and down in the midst of the stones of fire.” Does seem to be referring to Job, and that Satan would come up to the 3rd Heaven, the mountain of God, along with the sons of God, among them, these angels being the stones of fire. As such Ezekiel 28:14 seems to match the story of Satan in Job. We have so far that Eze 28:12-13 refers to Eden, then there is this portion, and then the rest of Eze 28:14 seems to refer to the story of Job. The dates given for Genesis would be circa 4000 BC, and the story of Job would be circa 1900-1700 BC. If this is working in chronological order, then that would mean that this section about Satan being the anointed cherub would have to take place between Genesis and Job. As Job is thought to be a contemporary of Abraham, whose story is in Genesis, that would mean that a story mentioning Satan as this anointed cherub would have to be found between Genesis and Job. If we run a word search for cherub or cherubim, for a time prior to Job, which would have to be in Genesis to be at Abraham’s time or before, we only get 1 result. There is only one result for a cherubim mentioned prior to the time of Job and Abraham. That is the cherubim that kept people away from the tree of life. Eze 28:14 says that God placed him as the anointed cherub that “covereth” or it also means to be a “hedge” or a “fence”, to “protect” or “cover with armor”. This seems to match. And so now we may have learned something totally new to many people: that the way that Satan was the “anointed cherub placed by God” was that he was the cherubim placed to guard the way to the tree of life. The Bible describes cherubim for us in Ezekiel 1 and 10. 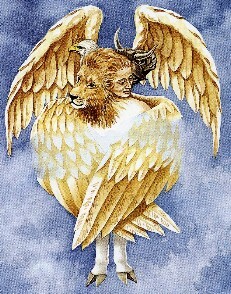 So we can know that this is generally what Satan actually looks like, is a cherubim. Not the red-faced goat man he is usually depicted as. The first time that Satan is seen to be rebuked by the Lord in the Bible is in Zech 3, and so this could match “perfect in thy ways from the say thou wast created, till iniquity was found in thee” because in Zech 3, this is the first time in the Bible, since the beginning of creation, that Satan is rebuked by the Lord. It should probably be noted that the word here for “found” matsa (4672) means to “to prove to be, to be secured, find to be sufficient, be enough” and so this does not seem to mean that this is the first time God has seen there is iniquity in Satan, but rather that this is the first time that it is openly proven, or in other words, openly rebuked. As a sort of riddle and a true observation, that would match rather well. Certainly the first time Satan is rebuked by the Lord openly in the Bible would be a noteworthy event to make mention of. Not a serpent, not the King of Tyrus, but Satan by name openly himself. Of course, Ezekiel prophesying Satan’s doom was a recent work at this time; Ezekiel seems to have been written from about 40-70 years before Zechariah. Going in chronological order, the next significant passage is Satan and the temptation of Jesus as seen in Matt 4 & Luke 4, circa 30 AD. The word in Eze 28:16 for “merchandise” is “rekullah” (7404) and it means “to traffic or trade”. It is interesting that in this passage in Luke 4, Satan offers to trade all the kingdoms of the world in exchange for Jesus worshipping Satan, to which Jesus refuses and answers him back with scripture, “Thou shalt worship the Lord thy God, and him only shalt thou serve.” Satan further indicates that he has “received” these kingdoms, and can give it to who he wants. This seems to imply Satan was given authority over these kingdoms by someone, but who gave them to him is not specified. It might imply some sort of prior trafficking, merchandising or trading, in which Satan received these kingdoms. 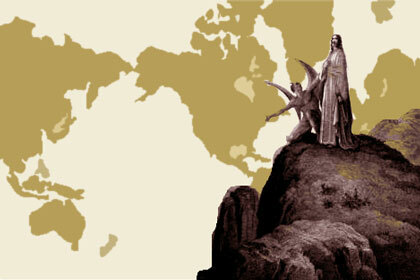 It is also interesting that Satan shows Jesus all the kingdoms of the world, or a multitude of kingdoms. And surely it is a sin to try to tempt others to worship you, let alone to try to tempt the Son of God, who is of the Godhead, God Himself, to worship you. That was a terrible sin. So in this passage of the temptation of Jesus by Satan as found in Luke, we have elements of Satan, first having received a multitude of kingdoms, then trying to trade or traffic a multitude of kingdoms, like merchandise, in exchange for worship, and in this Satan sins against God in Jesus Christ, our Lord, The Lord, King of Kings and Lord of Lords. This seems to be a match also, and Eze 28:16 seems to be referring to the temptation of Jesus Christ by Satan, as is seen in Luke 4 (which is also paralleled in Matt 4) by saying “By the multitude of thy merchandise they have filled the midst of thee with violence, and thou hast sinned”. 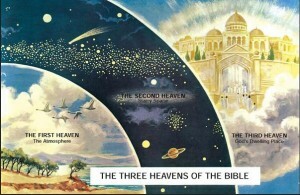 We earlier identified the mountain of God as likely being the third heaven. As such it would make sense here that this is referring to Satan being kicked out of the third heaven. If this is where the sons of God meet, then there is a connection that in being cast out of the mountain of God, that Satan is also being disallowed from where the sons of God go, the angels go, when they present themselves to God. 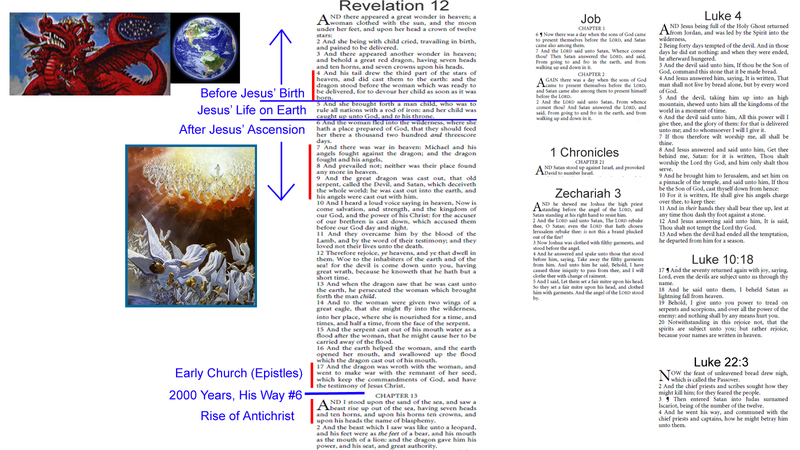 The next parallel event in our chronology is the war and heaven, in Rev 12:7. So, Satan will be destroyed out of being among the stones of fire, or removed from the presence of the angels of God in the third heaven. This would seem to parallel well the war in heaven, and the Holy angels taking a stand against Satan, and his angels, and them being banned from heaven, as Rev 12:8 states “neither was their place found any more in heaven”. 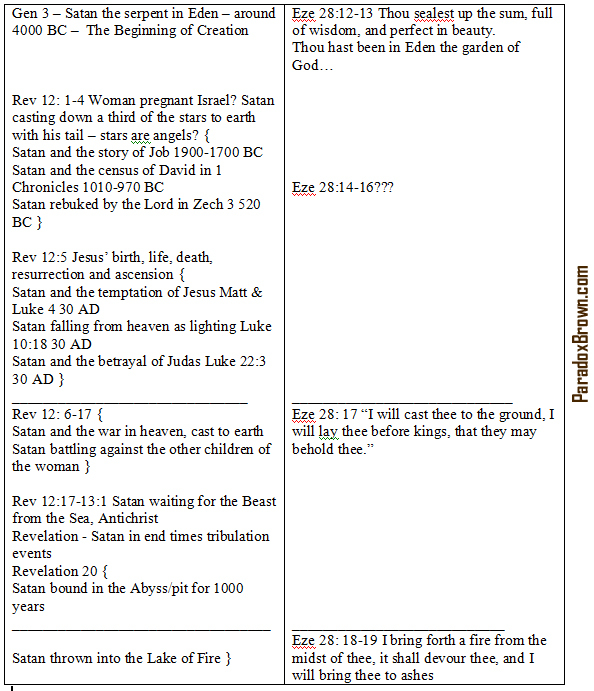 Here Satan is mentioned to be cast to the ground, and reasons why are given. That Satan is cast to the ground would parallel the next event in the chronology of Revelation 12, which is that after Satan loses the war in heaven, he is cast down to the Earth. 18 … therefore will I bring forth a fire from the midst of thee, it shall devour thee, and I will bring thee to ashes upon the earth in the sight of all them that behold thee. 19 All they that know thee among the people shall be astonished at thee: thou shalt be a terror, and never shalt thou be any more. A fire coming from the midst of Satan and devouring him, to ashes, would seem to refer to the end of the millennial reign, when Satan is loosed from his prison in the Abyss, and goes out to deceive the nations, and then they are consumed by fire from heaven, and Satan is thrown into the lake of fire, all taking place at the end of time, in Revelation 20. Rev 20:7-10 And when the thousand years are expired, Satan shall be loosed out of his prison, And shall go out to deceive the nations which are in the four quarters of the earth, Gog and Magog, to gather them together to battle: the number of whom [is] as the sand of the sea. And they went up on the breadth of the earth, and compassed the camp of the saints about, and the beloved city: and fire came down from God out of heaven, and devoured them. And the devil that deceived them was cast into the lake of fire and brimstone, where the beast and the false prophet [are], and shall be tormented day and night for ever and ever. Something I’d like to note though, is that in Ezekiel 28:18, no mention is made, or nothing seems to point to Satan’s imprisonment in the pit or Abyss. It’s like this event is skipped over, but it is not the only event that is skipped over. We did not seem to find a match to Satan provoking David to take a census either. But at the same time, the census could be considered a minor event, whereas it might seem that Satan being imprisoned in the pit or Abyss for 1000 years could easily be considered a more major event. So let’s just leave a question mark on that absence for now, as we’ll get back to that later. So what have we been doing here? 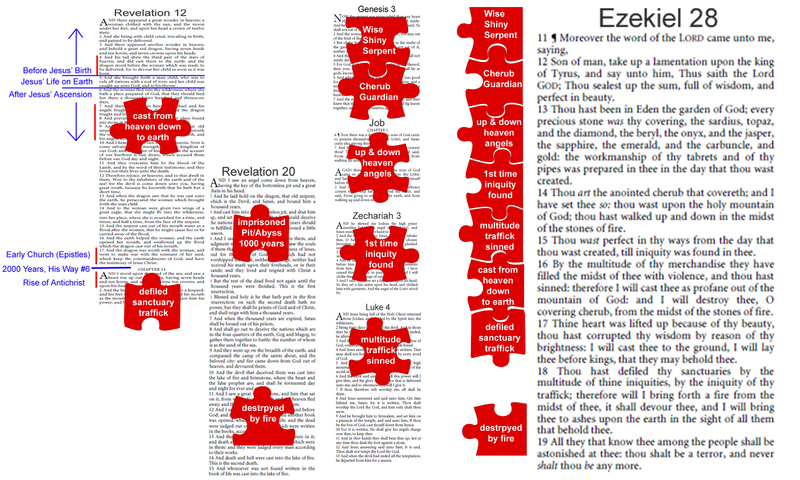 We have been handling the scriptures like they are a puzzle, composed of pieces, which were designed to fit together. Just like in doing a puzzle, we don’t have to understand the big picture, to match together a red jigsaw piece with another red jigsaw piece, their visual imagery matching, and which perfectly fit together, because they were designed to fit together. Why did we find that the sentences in Ezekiel 28 matched clear stories about Satan’s history throughout the Bible? Because this is an intelligently designed puzzle, in which these sentences were designed to match the clear stories given about Satan in the Bible. Each sentence or snippet of prophecy is a little riddle or puzzle, which was designed to be figured out and matched to connect it to a story about Satan. What we needed to match the prophecy to the events was first to note a similar image or action, a relationship between the subjects of the verse and what they were doing, and also to look for markers or keywords which matched, describing actions of, descriptions of, or relationships between subjects in the clear passages about Satan. Sometimes had to look up the detailed meanings of the words in their original languages, to see how they fit, but the information was all present that was needed to make the connection. And it is not a coincidence that these pieces fit so well in chronological order. As we covered in part 2 of this series, our 1 point or precedent is that God’s Writing Style is to write in chronological order. There can be exceptions, but we didn’t find any here in Ezekiel, which is part of why it makes a good learning exercise. Another point, covered in the Part 3 addendum, is point #6, the patience of God, that sometimes there can be long gaps of time that go between individual verses (or sentences) which have to be deduced from context, but that other portions of scripture may confirm this. In this case, Revelation and various clear passages about Satan give that information. 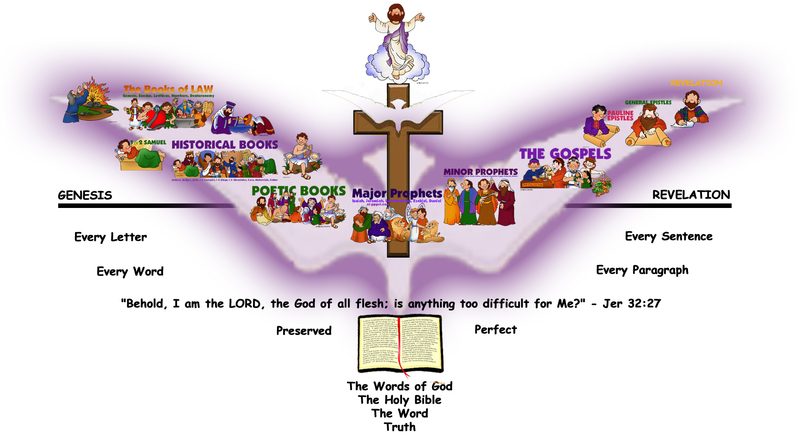 And I’d like to remind everyone, as covered in part 1, that God wrote the Bible, the Word, which is Jesus Christ, by His Holy Spirit. Different writers, at different times, but it all came from the same ultimate author, who is God. So it is entirely allowable in the framework of an eternal God as sole ultimate author of the Bible, with a foreknown predestined level of preservation of the Word itself, to have designed puzzles in accordance with consistent patterns, and revealed Himself and information to us in this way, through the Bible. That such can be seen is not surprising within such a framework context, but rather should be more expected than perhaps it is seen to be, as allowable. And result we are getting from putting together this puzzle is that we now have 3 sets of information which are chronologically lining up and tying together, matching and fitting into each other. Our first set of information was everywhere the Bible mentions Satan by name, narrowed down to major events in which Satan is described to do or say something, throughout the Bible. Our second set of information was a subset of the first set, which would be where Satan is mentioned both by name, and in the context of being “the dragon, serpent of old” in the book of Revelation, mainly specifically in chapters 12, 13, and 20. We fit the first set of information inside of the second set, lining it up. 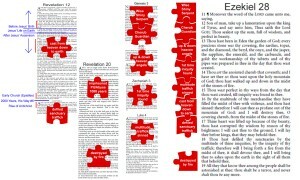 And our third set of information was the passage of Ezekiel 28, which connected and lined up with the other 2 sets of information, one puzzle piece at a time. And we did learn something new, which was that Satan seems to be the Cherubim mentioned in Gen 3:24 which guarded the tree of life in Eden, and that God chose Satan for this job. Why would that be? Let’s look at the story in more detail. God loved Adam and Eve, and wanted what was best for them. There seems to be great concern or alarm here that the man might also eat from the tree of life, and live forever. The reason for that can be argued to be that now that man was sinful, and spiritually dead in sin, that man was now in a state of evil and imperfection spiritually. If man now were to eat from a tree that would make them to physically live forever, that would mean they would be sinful, or evil, immortals – much like the fallen angels who will be cast into the lake of fire. Planning on the atonement of Jesus Christ, and new life in the Holy Spirit, before creation was made, God knew that it was better for man to die, but be resurrected into new life, and be spiritually born again, than for man to become immortal while in this sinful evil state. If man had eaten from the tree of life, they would have immortality on their own, and would not have been able to receive salvation and eternal life in Jesus Christ through being born again, and given new bodies, because their old bodies would have never died. God had a plan to redeem them, and knew it would be better for them and mankind in His plan, and it would be much worse if they gained immortality while in this evil state. So the key word here is Protection, God wanted to protect Adam and Eve and their children, from the situation getting any worse. God knew that Satan was the one who had deceived Eve, through the serpent, because God is all-knowing. God seems to handle the situation by putting responsibility on Satan to be the one to see to it that the situation didn’t get any worse. There’s a couple thing to keep in mind here, which is that 1) Satan was only 5 days older than Adam and Eve, and 2) God loved Satan, also, as His creation. So apparently how God handled this was that Satan had made a mistake, and God gave him a job to do, preventing the situation from getting any worse. Satan had set into motion events that harmed Adam and Eve, but in keeping man away from the tree of life, Satan was going to be protecting them from something worse happening. And so Satan got stationed as basically the security guard for the tree of life in Eden, a position that we can safely guess had to have lasted until the Flood of Noah’s time, about 1600 years later, when the location of Eden seems to have been lost, along with the tree of life. Which means that for about 1600 years, Satan was located in Eden, stationed there, guarding the tree of life. This could be looked at as chance to make up for his earlier mistake, show better character, by protecting mankind. But it also could be looked at as God’s justice and a practical chastisement in a way, that Satan was kept away from humanity, for a long time, in a very long time out. Man was driven out of the garden, but Satan was made to stay there, in the empty garden, for a very long time. God is love, and in this we can see God’s love, justice, mercy, and patience, interwoven in this decision on how God chose to handle the matter. This seems to shed some new light on the story in Job, that there is more meaning behind the question God asks Satan, and Satan’s reply. “And the LORD said unto Satan, Whence comest thou? Then Satan answered the LORD, and said, From going to and fro in the earth, and from walking up and down in it.” It could be taken that this was a change of pace from what Satan was used to, because prior to the Flood Satan had been stationed in Eden, but after the Flood he was able to travel to and fro, up and down the Earth. 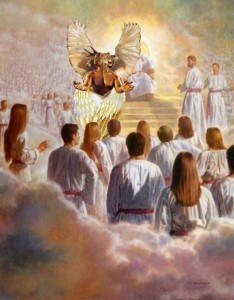 And also, that now Satan was able to come up to the third heaven, whereas prior he had been stationed in Eden on Earth. What this does tell us however, is that it seems Satan was not up to much else but being stationed in Eden, prior to the Flood. This could tentatively narrow down the date range for us of Satan’s activities, in when did Satan sweep down a third of the stars of the sky with his tail, down to earth. Since we are told what Satan was doing, stationed in Eden, presumably up until the Flood when Eden was lost, and we can see it’s note is made that after the Flood, in Job or Abraham’s time, Satan was traveling the Earth, then it might make sense that it was not until after the Flood, and the Eden stationing ended, that satan got busy with the activity of sweeping down a third of the stars with his tail, down to earth. Arguable, if Satan was in Eden, and not the third heaven, prior to the Flood, then Satan would not have been able to sweep stars down to earth from heaven, until after the flood when he was not tied down in Eden, and now able to roam the Earth or go to the third haven freely. So tentatively, this might narrow down this dangling question, to a more narrow timeframe of when, to being after the Flood, but before Jesus Christ was born. We also have gained some new insight, but also more questions, regarding Satan’s authority over the kingdoms of the world. 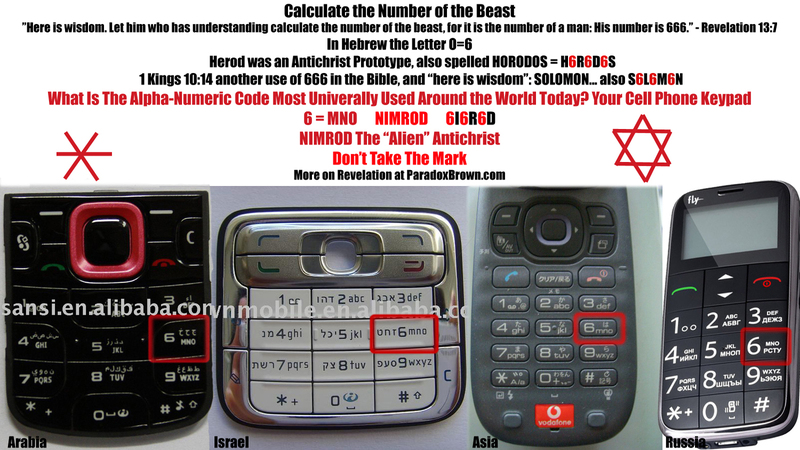 It seems that in Rev 13:2 Satan will hand his authority over to the Beast from the Sea, the Antichrist. And we can see that in Luke 4, prior to this, Satan tempts Jesus Christ by offering to hand his authority over the kingdoms of the world over to him in exchange for worship, and Jesus refuses. Ezekiel 28 in both these instances refers to this handing over of kingdoms as “trafficking, trading, or merchandising”. There is a little timeline going her in itself, that first Satan offers to hand authority over to Jesus, and then later hands it over to the Antichrist… but eventually Jesus Christ returns and has all authority over the kingdoms of the world, and so Satan loses this authority. But the piece we are missing is the beginning. In Luke 4 Satan says he has received this authority, and he can do what he wants with it… but so far we do not know who Satan has received this authority from, or how he received it. So this is an unanswered question: how or when did Satan receive authority over the kingdoms of the world? Many people, I have heard, teach that God gave this authority to Satan, assuming this is what is meant by “anointed cherubim”. However, what the Bible indicates is that “anointed cherubim” refers to Satan being stationed as a security guard in Eden, to guard people away from the tree of life. So there is nothing in this phrase, of the rest of Ezekiel 28, which indicates or tell that God gave this authority over the kingdoms of the world to Satan. Yet Jesus Christ in his time here on earth did not dispute this as reality, calling Satan, “the prince of this world”, so while this is true, we still do not know how it is so. 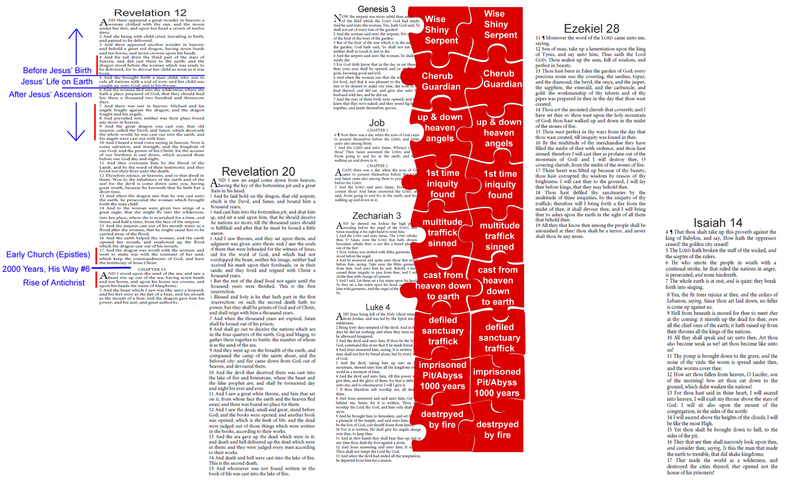 Before we started into adding Ezekiel 28 to this puzzle, we had a question: what are the stars that Satan swept down to earth with his tail? Looking up stars in Revelation we saw they could represent angels, and noted that Satan’s angels were later also cast out of heaven with Satan after the war in heaven. But the time period given for this event would have to be before Jesus was born. The closest visual image that match out of known events mentioning Satan by name was the story of Job, in that many angels and Satan were mentioned together, but it was not a perfect match in that the visual of Satan’s tail sweeping these angels down to earth was not represented. Ezekiel 28 did seem to verify the event in Job as being significant, at least in contrasting this to the census of David which did not seem to get a mention in Ezekiel’s parallel chronology, but that could be for whatever reason. In any case, we do not seem to have found any additional insight on this question of the event of Satan’s tail sweeping down a third of the stars, as of yet. So now we have added another dangling question, puzzle pieces which do not seem to be explained anywhere yet: when and how did Satan receive authority over the kingdoms of the world? This also seems to be have happened by the time when Jesus Christ was born, but when did this begin? And let us also hearken back to that the woman in Rev 12 is pregnant for a long unknown time, which depends on her identity, and this event of Satan sweeping down a third of the stars with his tail to earth may have been a gradual event occurring over a long period of time. These are our questions, but they are also our clues. Not having answers, let’s leave them dangling out there for just a little while longer. And we have another clue, which is an omission of a significant event from Ezekiel: how is it that Satan’s imprisonment in the pit or Abyss for 1000 years did not warrant a mention in this parallel chronology? It seems to be rather obtusely missing from a chronology, which otherwise, noted many major events of Satan’s story told in plain passages of the Bible, in precise chronological order, which was quite amazing. God is amazing. So as we now know that Ezekiel gave a chronological parallel of both events in Revelation, and clear passages in the Bible mentioning Satan by name… could it stand to reason that there might be more parallel chronologies given in other passages of the OT? Everything major seems to have been covered in which Satan is mentioned clearly by name, except for the events seen in Revelation 20. So, much like we searched for keywords from Revelation, looking for an “old serpent”, regarding Satan’s beginning, let’s see if there’s any keywords in Rev 20 that might lead us to an Old Testament prophecy regarding Satan’s ending. Rev 20:1-3, 7-10 And I saw an angel come down from heaven, having the key of the bottomless pit and a great chain in his hand. And he laid hold on the dragon, that old serpent, which is the Devil, and Satan, and bound him a thousand years, And cast him into the bottomless pit, and shut him up, and set a seal upon him, that he should deceive the nations no more, till the thousand years should be fulfilled: and after that he must be loosed a little season. And when the thousand years are expired, Satan shall be loosed out of his prison, And shall go out to deceive the nations which are in the four quarters of the earth, Gog and Magog, to gather them together to battle: the number of whom [is] as the sand of the sea. And they went up on the breadth of the earth, and compassed the camp of the saints about, and the beloved city: and fire came down from God out of heaven, and devoured them. And the devil that deceived them was cast into the lake of fire and brimstone, where the beast and the false prophet [are], and shall be tormented day and night for ever and ever. Now, Satan being destroyed by fire was already mentioned in Eze 28, so that might not be where to start. 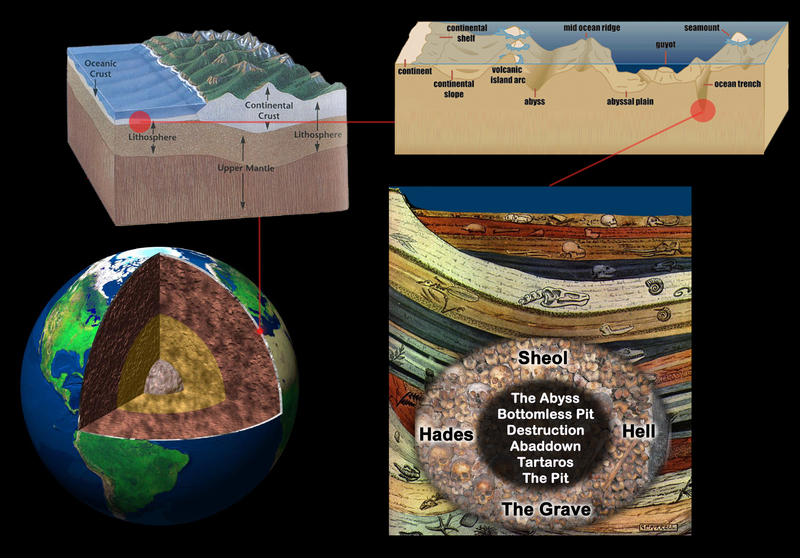 What really seems to be missing is Satan being bound and shut up in the bottomless pit, the events of Rev 20:1-3. There is a detailed study on my website called “A Survey of the Abyss in the Old and New Testaments” which is on the Abyss or Bottomless Pit as seen in both the Old and New Testaments, which I believe covers every time it is mentioned in prophetic passages and elsewhere, if you are interested. But for the purposes of this study, let’s say we’ll just do a word search and see if we can find any Old Testament passages to parallel Revelation’s chronology. The term “pit” is used many times in Isaiah, Jeremiah and Ezekiel. We would have to spend time reading and sorting through all of these, but as I have already done so, there’s a few of note. Ezekiel 31 and 32 mention the Assyrian cedar of lebanon, many other cedar trees and mighty warriors being sent down to the pit, Eze 26 mentions a city Tyrus going down to the pit, and Isa 24 mentions someone going down into the pit, and someone coming up out of the midst of the pit, but for the purposes of this study, let’s stop and look at Isaiah 14. This passage begins with mention of a rest and ceasing of the city Babylon, and ends with the King of Babylon being throne into the pit. That would generally seem to be the same picture as in Revelation 20, Mystery Babylon has been destroyed, and Satan is thrown into the pit. But we are going to shift gears here a little. That is because there are really too many advanced external prophetic references here in Isaiah, that reveal the timing, to go into detail here in trying to prove all of them out. But still we can and will see a loose similar picture that matches, and so we will just go on that. The first thing of note here is that this mentions a day in which the Lord gives rest, which as a day is a thousand years, many see the millennium as a 1000 year rest period, a Sabbath, and it is referred to as God’s rest in Heb 3-4. Next, the city Babylon has ceased, which could refer to Mystery Babylon being destroyed at the beginning of the millennial reign. And this is addressed to the “King of Babylon”, much like in Ezekiel it was addressed to the “King of Tyrus”. As prophecies can be cyclic and have both literal or spiritual fulfillments, points #8 and #10, this is allowable. Or again, Satan being the spiritual king of Babylon in Isaiah’s time, along with a human king of Babylon, it is allowable for this to be meant for both in ways. 5 The Lord hath broken the staff of the wicked, and the sceptre of the rulers. 6 He who smote the people in wrath with a continual stroke, he that ruled the nations in anger, is persecuted, and none hindereth. 7 The whole earth is at rest, and is quiet: they break forth into singing. 8 Yea, the fir trees rejoice at thee, and the cedars of Lebanon, saying, Since thou art laid down, no feller is come up against us. The Lord’s rest would make the whole earth to be at rest, in peace, during the millennial reign, so this matches. Also the “cedars of Lebanon” rejoice. From my studies, these are the “sons of God” of Gen 6 who have been released as locusts in Rev 9, and are repentant, here rejoicing as Satan is laid down, and being let alone, no lumberjack coming up against them during the millennial reign. 9 Hell from beneath is moved for thee to meet thee at thy coming: it stirreth up the dead for thee, even all the chief ones of the earth; it hath raised up from their thrones all the kings of the nations. 10 All they shall speak and say unto thee, Art thou also become weak as we? art thou become like unto us? 11 Thy pomp is brought down to the grave, and the noise of thy viols: the worm is spread under thee, and the worms cover thee. Here Sheol, filled with bones of dead people from before the Flood, and bodies of dead nephilim, declare unto Satan that he has become as weak as them, and he lies in a grave. 12 How art thou fallen from heaven, O Lucifer, son of the morning! how art thou cut down to the ground, which didst weaken the nations! 13 For thou hast said in thine heart, I will ascend into heaven, I will exalt my throne above the stars of God: I will sit also upon the mount of the congregation, in the sides of the north: 14 I will ascend above the heights of the clouds; I will be like the most High. 15 Yet thou shalt be brought down to hell, to the sides of the pit. The exclamation here about “How art thou fallen from heaven” does not seem to refer to this being the time when Satan falls to earth, but rather is an exclamation, meaning oh how very much so he has fallen, all the way from heaven way down to the pit. Reasons why are given, emphasizing he wanted to be like God the Most High, but he is going down to Sheol, to the Abyss or pit, the lowest place. That “Lucifer, son of the morning” can be translated “shining star, son of the morning” which would again reference to Satan as shiny, as the nachash, but also to Satan as a “morning star”. It is my view that the “host of heaven” as the broadest term, are divided into 2 subcategories, the “sons of God” which are messenger angels, watchers, which look like men. And the second category would be the “morning stars”, which are the cherubim or seraphim. 16 They that see thee shall narrowly look upon thee, and consider thee, saying, Is this the man that made the earth to tremble, that did shake kingdoms; 17 That made the world as a wilderness, and destroyed the cities thereof; that opened not the house of his prisoners? And people are said to look at him, wondering in seeing him, how it is that this weak person is the one who caused so much destruction. This overall seems to fit a description of what would make sense for it to be like when Satan is thrown into the pit. People wonder to see him as weak, angels on God’s side rejoice, the reasons why he’s sent down match, and the timing of this starting right after Babylon is destroyed, and the Lord has broken the power of the rulers, and the whole world is at rest: this all matches. And it lists all the many reasons why this occurs, and gives more details on these events. And as I said, you have noted we shifted gears here a little, because there’s really too many advanced external prophetic references here in Isaiah, that reveal the timing, to go into detail here on all of them. But, to the point, there is a loose visual imagery match that is present, as it does seem that this generally fits as a parallel chronology giving more detail on Satan being imprisoned in the Abyss or bottomless pit at the beginning of the millennial reign, as described in Rev 20. So let’s add it to the chart as such. When did Satan say this? It would seem, from what we looked at earlier, that Satan was stationed in Eden for some 1600 years, and during that time had to stay there, on Earth in Eden. The temptation in Eden seems to have taken place early on, may less than a year after creation, maybe only a few days after the creation week. So it seems that during this 1600 years, Satan spent no time in Heaven, and prior to that he had spent very little time in Heaven also. In Job, we can see what is possibly expressed as excitement, in that Satan was then traveling to and fro, walking up and down the earth – which would make sense if he had been stationed for 1600 years in Eden. He would not have been able to travel the Earth, or go to Heaven, so it would make sense to note he was now able to do so. So would it make sense, that perhaps during this time in Eden, that Satan would say “I will ascend into heaven”? Let’s keep in mind that after the flood, in the time of Job, Satan seems to be free to come into Heaven, and is also likely seen there in Zech, and generally is able to be there until the war in heaven, after Jesus Christ’s ascension. At which point he is banned, and this is clear, so it seems he would not be saying “I will ascend into heaven” after that point. This leaves the time period in Eden as being the most likely time period in which Satan would be saying “I will ascend into Heaven”. But look at what follows, “I will exalt my throne above the stars of God.” Here the stars of God are mentioned. This may be a clue relevant to one of our questions, of how is it Satan swept down a third of the stars down to earth with his tail? It seems that the “stars of God” here are likely angels of God, and that Satan had said in his heart he would exalt his throne above the stars of God. “I will be like the most High” And this “I will” could parallel very closely to what we see in the temptation of Jesus, in which Satan tries to tempt God to worship him, and is even trying to trade his power over the kingdoms of the world in exchange for this worship. Sometime before the birth of Jesus, but likely after the Flood, Satan swept down a third of the stars with his tail to the earth. This may have happened over a long time, based on the woman being pregnant, if she represents Israel waiting for the Messiah. Satan received authority over the kingdoms of the world somehow, before the time of Jesus, but we are not told how or when. Satan was stationed in Eden for 1600 years, and did not seem to be doing much else, such as traveling the earth or going to heaven. There’s nothing indicating Satan yet had authority over the kingdoms of the world at this time. So this also likely indicates Satan received authority over the kingdoms of the world, after the flood. Around 1700-1900 BC we see Satan assembling with the “sons of God” in heaven, in Job, and Isa 14 indicates Satan had a desire or agenda to “exalt his throne above the stars of God”, or angels of God – perhaps after wanting to ascend into heaven (likely in Eden) and perhaps before wanting to be like the Most High and receive worship, seen in Luke. 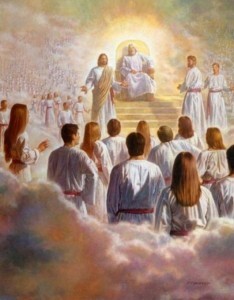 This might seem to imply that the angels of God had thrones, in order for Satan to be wanting to exalt his throne above them, or their thrones, and “mount of the assembly” is a similar scene to the assembling of the “sons of God” meeting in Job, likely paralleling the third heaven that Satan is later seen to be cast out of. By 700 BC in Isaiah, Satan is called the King of Babylon, and by the 590-570 BC in Ezekiel Satan is called the King of Tyrus. So it would seem Satan had authority over at least 2 kingdoms of the world by 570 BC, and in Zech 3, circa 520 BC, we see him being rebuked by the Lord, in a scene likely set around God’s throne. At this point, we have seen what seems to be all the clear passages on Satan fit together, in chronological order, aligned with Revelation, with Ezekiel 28 and Isaiah 14 giving confirmation or more details about all of these events. 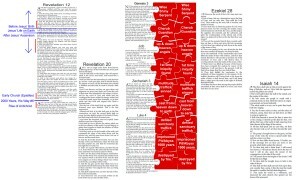 We have covered all the pieces and seen them tied together into an internally consistant comprehensive chronology, and there are no more passages we easily know about Satan to be found that seem to add in here. It would seem like the puzzle should be completed, and we should be having that Aha! Moment where everything makes sense. However, we are still left puzzling about whatever it is these clues are referring to. They all seem to point to the time range from Job up to Isaiah, from about 1900-1700 BC to 700 BC, and something to do with the sons of God or stars of God and their assembling. It almost seems like Satan wants to exalt his throne above the angels of God who assemble? So, some angels are getting together in Heaven, what’s the big deal? So for those of you who are familiar with the Divine Council, thank you for bearing with me, I just really wanted to highlight the importance of understanding the Divine Council, and I hope you have enjoyed beating around the logical bush with me, to see that all roads lead to needing to understand the Divine Council. But for those of who do not, without further ado, let’s get into what the divine council is.